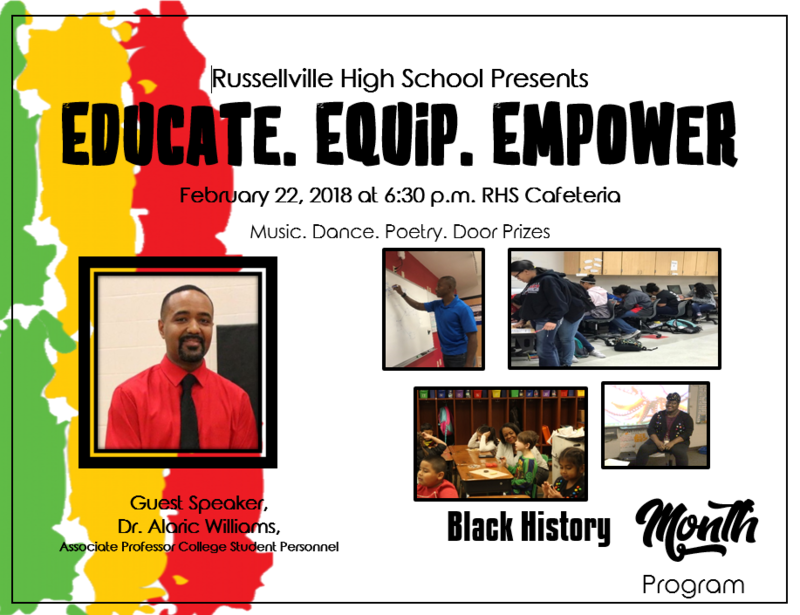 Russellville High School will host their annual Black History Month Program on Thursday, February 22, 2018, at 6:30 p.m. in the RHS Cafeteria. This year’s theme is “Educate. Equip. Empower.” and will feature guest speaker Dr. Alaric Williams, interim department head and associate professor in the Department of College Student Personnel at Arkansas Tech University. Dr. Williams joined the faculty at Arkansas Tech in August 2015 after serving seven years as an assistant professor and later associate professor at Angelo State University in San Angelo, Texas. Dr. Williams has an earned doctorate degree in supervision, curriculum & instruction in higher education and a masters degree in counseling/student affairs. In celebration of Black History Month, students at RHS interviewed African American teachers in the Russellville School District. Check out the video below.